← Which do you prefer: Reese’s Pieces or Peanut Butter M&M’s? 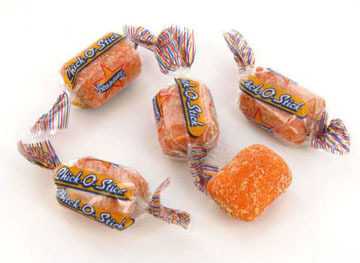 Chick-O-Stick … Where have you been all of my life? According to their web site, these have been made by the Atkinson Candy Company since 1932. This is a peanut butter, flaky center rolled in shredded, toasted coconut. The center is much like a Butterfinger bar, and it looks like petrified wood. So far this doesn’t sound appetizing, does it? They are supposed to be hard, but can get soft with humidity. So we can assume the Chick-O-Sticks eaten at any SEC game are really chewy. Frankly it’s impossible to tell if these are stale….again, not appetizing huh? The Chick O Stick comes in many sizes. I prefer the smallest, bite size. The large stick is visually unappealing and flakes all over everything. I have pieces lodged in my keyboard as I type this. Plus, the large stick is hard to break into smaller pieces. I tried knocking it on my desk, and after a few glances from my co-worker, I walked down the hall, and dropped it on the floor on the copy room (yes, it was wrapped the whole time), and it barely cracked! Crumpled, these would make a good topping for ice cream or cup cakes. Here’s a recipe for Vegan Chick-O-Stick cookies. I have no idea what they will taste like, but the author swears that they’re good…they look pretty. You can find these where most penny candies are sold, specifically on the bottom shelf of the candy aisle in any convenience store. I think they are under-rated and should be moved up to at least the middle shelf. It’s always a good day when you discover a new candy. Hmmm, that would make a good slogan…. Thanks to Old Time Candy for the photo. Posted in coconut, Peanut Butter. Bookmark the permalink. “…pieces lodged in my key board as I type this.” Hee Hee Hee! what a great image of a dedicated researcher.